Particles can be sampled for unbiased estimates of volume in a number weighted, volume weighted, or surface-weighted manner. For number weighted estimates thick sections are used since a disector is required. For volume weighted and surface weighted estimated thin sections can be used. The probes that are used to estimate the volume of particles are the nucleator, the planar rotator, the optical rotator, point-sampled-intercepts, and surface weighted star volume. The discrete vertical rotator has been developed for estimating the volume of organelles at the electron microscope level. Traditionally, due to ease of use and continuity, point-sampled intercepts is used with volume-weighted sampling and surface weighted star volume is used with surface weighted sampling, but any of these volume probes can be used with any of the sampling methods. By far the most common and useful combination for looking at groups of particles is the number weighted sampling and the nucleator, since the nucleator is easy to use and number weighted sampling picks cells without regard to the size of their volumes or surfaces. Ideally, these local probes that estimate volume of particles should be performed on isotropic or vertical sections, but this rule is often broken. If you perform one of these probes on preferentially-oriented sections, the results will not be unbiased, but you can still get something out of this data. Plot the estimated areas in a histogram and report that these are biased estimates in that the orientation of the particles is not random. In other words, you tried to keep the sectioning in the same orientation for each animal (e.g., coronal), and you realize that over- or under-estimation of the real volumes may occur due to the fact that every orientation in space is not a possibility for the particles. 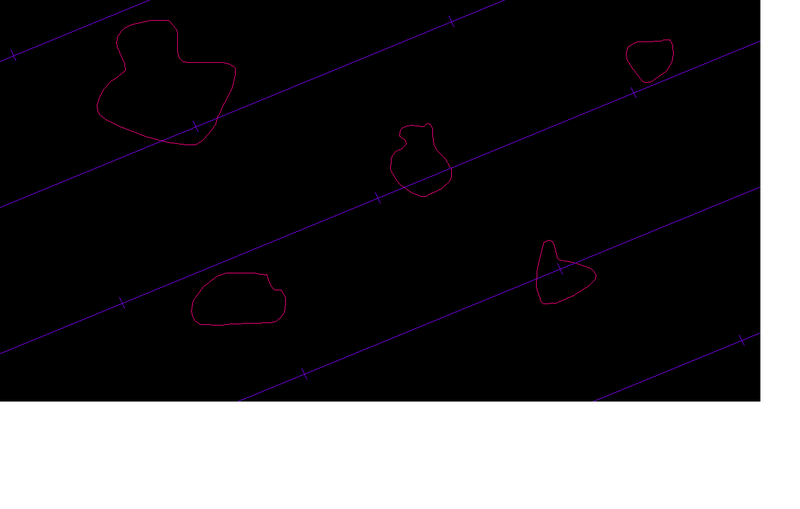 Of course if you use isotropic or vertical sectioning, you won’t have to worry about this bias. Three probes that estimate particle volume and are suitable for use with number weighted sampling are Nucleator (Gundersen, etal., 1988), Planar Rotator (Vedel Jensen and Gundersen, 1993), and Optical Rotator (Tandrup, etal., 1997). For estimating particle volume, these local probes are thought to be better than the global probe Cavalieri/point-counting because the latter tends to over-estimate (Tandrup, etal., 1997, Fig. 9). For the nucleator, planar rotator, and optical rotator, ‘The overall impression is that the estimation methods give very similar results’ (Tandrup, etal., 1997, p 114, second full paragraph, third sentence). The standard error of the mean divided by the mean values are lower for the optical rotator (Tandrup, etal., 1997, Fig. 10), but this three dimensional estimator is not as fast to use as the two-dimensional probes, the nucleator and the planar rotator. ‘The optical rotator is chosen if very precise estimates on single cells are necessary’ (Evans, etal., 2004. Chapter 9, Introduction, p 198, last sentence). Please note that for the area and volume estimates, the lengths are first squared or cubed, and then the mean of these squared- or cubed-lengths is multiplied by π or 4/3 π to come up with the estimate (Gundersen, 1988, pg. 4, ‘THE STANDARD IMPLEMENTATION OF THE NUCLEATOR IN MONOCLEATED CELLS’ paragraph (3) ‘Take the average of the two cubed distances’; Howard and Reed, 2011, equation 9.2; Evans etal., 2004, pg. 199, equation 1.1). The planar rotator (Vedel Jensen and Gundersen, 1993) comes in two forms, Isotropic Planar Rotator or Vertical Planar Rotator, depending on if isotropic or vertical sections are used. Computer simulations show the variance of the estimates is lower than with the nucleator (Vedel Jensen and Gundersen, 1993, Fig. 5). This probe is based on the Pappus-Guldinus theorum (Vedel Jensen and Gundersen, 1993, section 3): “If any planar figure revolves about an external axis in its plane, the volume of the solid so generated is equal to the product of the area of the figure and the distance travelled by the center of gravity of the figure”. For the vertical planar rotator, pick the particles without bias using a disector for number weighted sampling on vertical sections. The vertical axis is drawn through a point in the particle cross-section, usually the nucleolus. It is fine to use one point to decide if the cell is in the study (see Criteria for Counting Cells) and another point, such as the nucleolus, to be on the vertical axis. Now you indicate the highest and lowest point through the cell profile, and this defines ‘h’. A grid of lines is randomly positioned parallel to ‘h’, and you define the spacing, ‘t’, among these lines. The farther away the organelles are from the vertical center line (through the centriole) the greater is the volume attributed to those organelles, because there is more volume farther away from then closer to the vertical line: in other words if the area is rotated around, the centroid of the area travels a farther distance. “The discretized rotator gave practically identical results to the classic rotator, which is more efficient than the nucleator” (Mironov and Mironov, pg 33, end of second paragraph and also see Table 1). The optical rotator (Tandrup, etal., 1997), unlike the Planar Rotator and Nucleator (see above), uses information from three dimensions for the volume estimate. 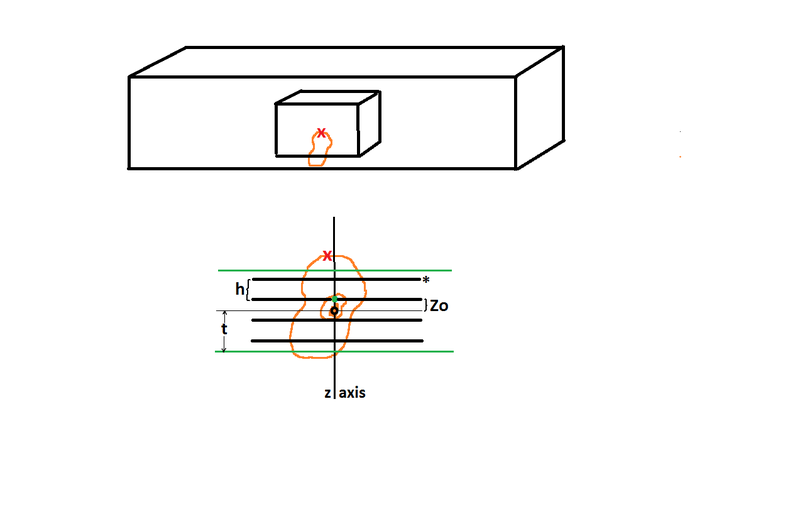 An optical disector is used to pick cells without bias so that thick sections are being used (see top of figure below) allowing for particle cross sections at different z-planes to be observed. As usual, use sytematic random sampling. If you don’t use systematic random sampling or random sampling to pick the particles for volume estimation, you will not be getting a good idea of what is going on throughout the whole region; and systematic random sampling is more efficient than random sampling. 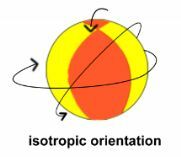 As for the nucleator and the planar rotator, pick a unique point in the middle of the cell (Tandrup, etal., 1997, see ‘O’ in fig. 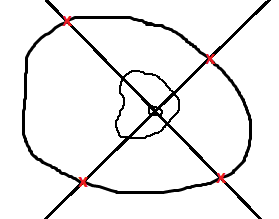 2 and see the ‘o’ in the bottom of the figure below), and this point may be different than the point you used to include the cell in the disector (see the red ‘x’ in the figure below). 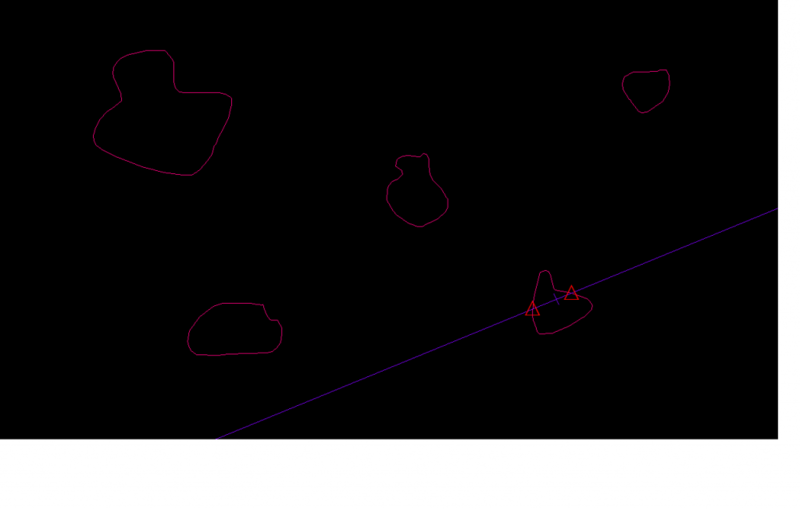 For instance you can use the top of the cell (red ‘x’) to decide if the particle is in the disector, and focus down to a nucleolus (black ‘o’) for this local optical rotator probe. A virtual slice of known thickness (Tandrup, etal., 1997, see ‘t’ in fig. 1, and also see ‘t’ in the bottom of the figure below) with its midpoint (thin black line going through ‘o’ below) through the unique point is generated; in the figure below this thickness, 2t, is bordered by the green lines. The thickness of the virtual slice could be the minimum cell diameter or the mean cell diameter (Tandrup, etal., 1997, fig. 6), as long as the ambiguous top and bottom of the particle are not included. Now the three dimensional part comes in. 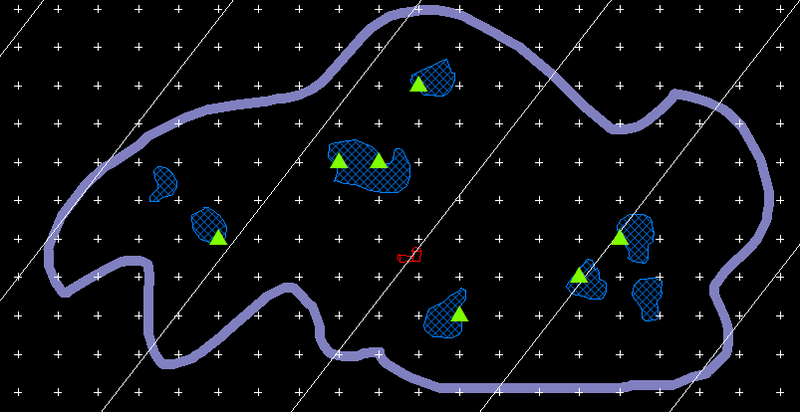 A distance of random length but less than ‘t’ from the unique point in the middle of the cell along the focusing axis is generated (Tandrup, etal., 1997, see ‘zo‘ in fig. 1). In the bottom of the figure below this is Zo, the distance from the unique point, o, to the green dot. Systematic random optical planes are designated starting there with a distance of ‘h’ separating them (Tandrup, etal., 1997, fig. 1). As you focus to each optical plane (four thick black lines within the green lines above) you will see parallel lines forming a grid. One of these planes is shown in the figure below; the asterisk shows this is one focal plane from the figure above. At each plane you mark where the lines of the grid intersect the boundary of the cross section of the particle (Tandrup, etal., 1997, fig. 3 and fig. 6 and see red ‘x’s’ below). The parallel lines emanate from an axis (y-axis, below) that is in the same relative place as the nucleolus (black ‘o’above is on the nucleolus, black ‘o’below is lined up with that, see Tandrup, etal., 1997, open circles and nucleolus in figure 6). 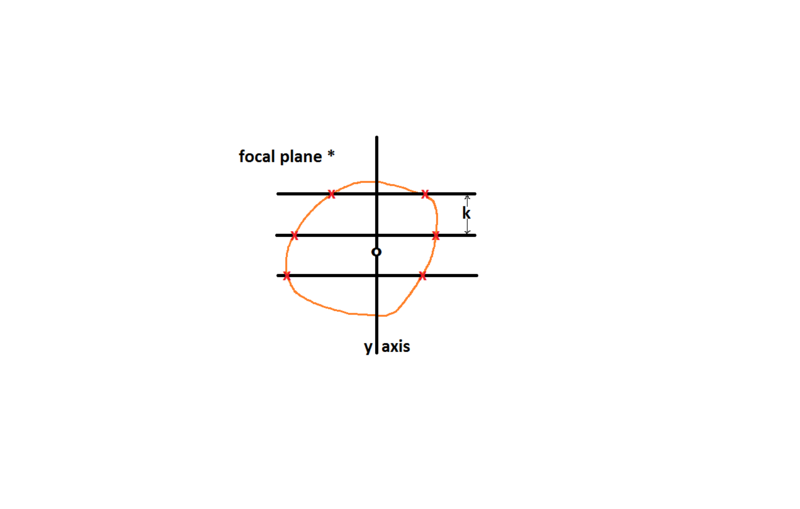 For each focal plane the lines are ninety degrees offset from each other; in the next focal plane the probing lines will be oriented up and down instead of horizontally as below. 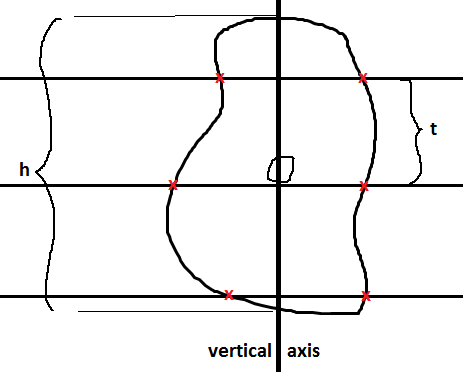 To account for particle cross sections with concavities, those stretches of the line that go through the cross section are given a positive sign and those that traverse the outside of the cross section get negative signs (Tandrup, etal., 1997, fig. 3). 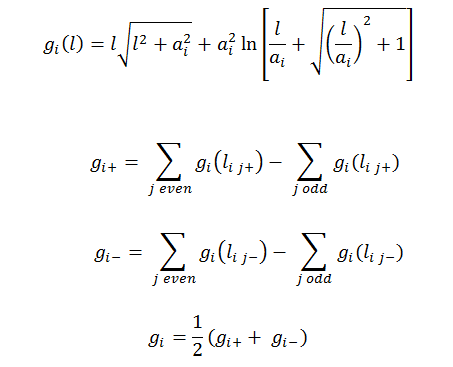 To understand these equations please refer to figure 2 in Tandrup, etal., 1997. The integrals regarding f as a function of x above “have no analytical solution, but can be solved numerically, e.g., by adjusted Simpson integration” (Tandrup, etal., 1997, p. 6, text below equations 5b and 5c). “Since the point is random inside the particle, it is not efficient to make two measurements in two opposite directions from the point, it is better to measure the length of the complete intercept through the point in a 3-dimensionally isotropic direction (on IUR or “vertical” sections). The coefficient to be used for calculating the volume-weighted mean particle volume, V v , is then π/3 instead of 4π/3. This special case of the general nucleator principle was described before the nucleator and has its own name, point-sampled linear intercepts, which also describes reasonably precisely what it involves.” (Gundersen etal., 1988, pg. 163, bottom of last complete paragraph). The intercept length, collected in a volume-weighted way is of interest when characterizing alveoli in lung (Knudsen, etal., 2010). Intercepts have also been used to estimate particle volume when the particles have been selected in a number weighted manner, i.e. by using a disector (Cruz-Orize, 1987). Cruz-Orize, LM. (1987) Particle Number can be Estimated Using a Disector of Unknown Thickness: the Selector, J. of Microscopy, 145 121 – 142. Evans, S.M., A.M. Janson, J.R. Nyengaard, 2004 Quantitative Methods in Neuroscience, Oxford University Press, Oxford, U.K.
Knudsen, L., Weibel, E.R., Gundersen, H.J.G., Weinstein, F.V., and M. Ochs (2010) Assessment of Air Space Size Characteristics by Intercept (Chord) Measurement: an Accurate and Efficient Stereological Approach. J. of Applied Physiology, 108, 412 – 421. Gundersen, H.J.G., and R. Osterby, 1981, Optimizing Sampling Efficiency of Stereological Studies in Biology: or ‘Do more less well!’. J. of Microscopy, Vol. 121, pp. 65-73. Gundersen, H.J.G., 1988, The Nucleator. J. of Microscopy, Vol. 151, pp. 3-21. Gundersen, H.J.G., Bagger, P., Bendtsen, T.F., Evans, S.M., Korbo, L., Marcussen, N., Moller, A., Nielsen, K., Nyengaard, J.R., Pakkenberg, B., Sorensen, F.B., Vesterby A., and M.J. West (1988) The New Stereological Tools: Disector, Fractionator, Nucleator and Point Sampled Intercepts and their Use in Pathological Research and Diagnosis, APMIS, 96, 857 – 881. Howard, C.V. and M.G. Reed, 2011, Unbiased Stereology, Second Edition QTP Publications, Liverpool, U.K.
Mironov, A.A. Jr. and A.A. Mironov (1997) Estimation of Subcellular Organelle Volume from Ultrathin Sections through Centrioles with a Discretized Version of the Vertical Rotator, J. of Microscopy, 192, 29 – 36. Reed, M.G. and C.V. Howard (1998) Surface-weighted Star Volume: Concept and Estimation, J. of Microscopy, 190, 350 – 356. Sorensen F.B. (1991) Stereological Estimation of the Mean and Variance of Nuclear Volume from Vertical Sections, J. of Microscopy, 162, 203 – 229. Vedel Jensen, E.B. and H.J.G. Gundersen (1993) The Rotator. J. of Microscopy, 170, 35 – 44. Vesterby, A. (1993) Star Volume in Bone Research, Anatomical Record, 235, 325 – 334.